This page is for Kids and big Kids! 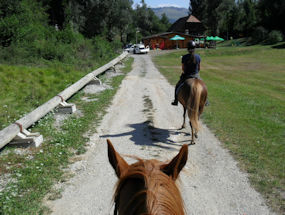 In our latest "Now you see it, Now you don't" what is the difference between these 2 photos of our riding school with views of the lovely Nanos mountain at Lipizzaner Lodge? 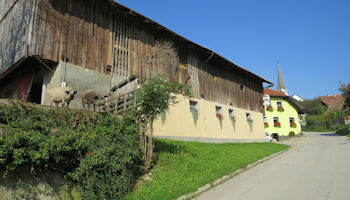 Yes, correct, the tree on the left has one less leaf in the second photo, well spotted! 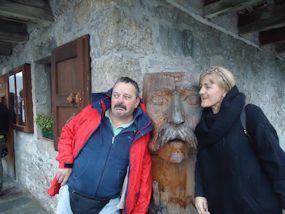 Check out these crazy trees we found in Koper, by the coast.. would you like to have a hairstyle like these guys! / also in Koper old town, we found a really cool carriage and practised our "royal waves"! (Let's face it, Chris definitely has the best wave)! 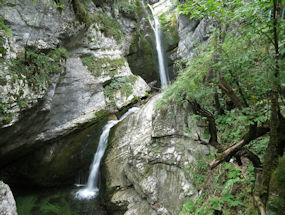 Can you SPOT the DIFFERENCE between these 2 photos of exactly the same waterfall, (Mostnica / Little Bridge falls)?? 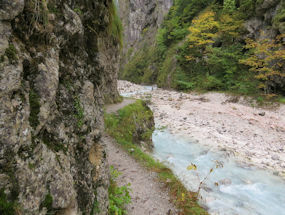 The only difference is the one on the right was taken a week later than the first one after there had been rain in the Alps, but wow, look at the difference in the power of the water! 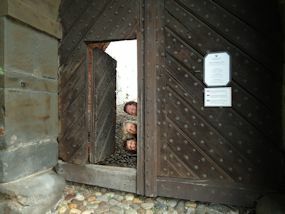 This is the main door at Velenje castle, but look what was waiting for enemy troops if they got through the door? / On the other side there are 2 holes where defenders could stab anyone getting through the main door.. painful. 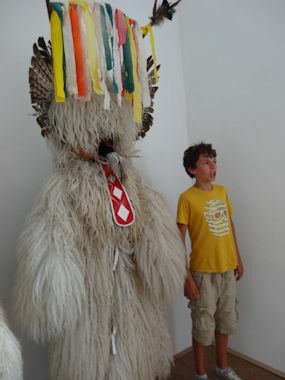 What about this cool guy standing on a pole in a secret square in Piran, by the sea.. very cosmopolitan! 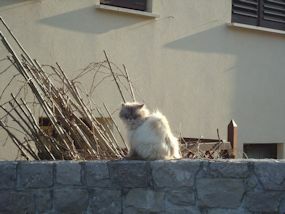 / and in the same square we found this cute white moggie. Check this out.. we found this pumpkin growing in the tree when we went plum picking! 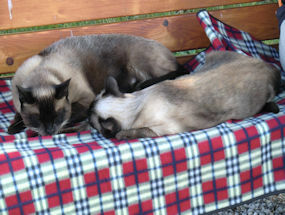 / and introducing our 2 new Siamese moglets at the Lodge, one is called Pumpkin and the other is Poppet, they are looking forward to meeting you! 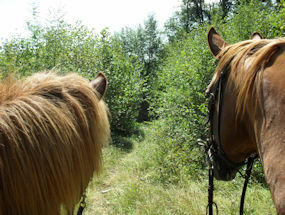 How do you like our "horse cam" in stereo! Just wandering around the local forest / then following the old Roman road used by carters in the old days to transport huge Slovenian oak trees to Venice to build the foundations of the island there.. look at the size of that log! 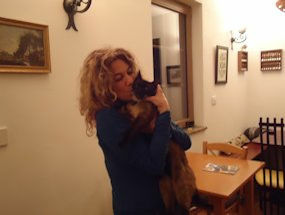 We really love crazy animal photos on our fun page and first you can see a genuine Slovenian "Hot Dog"! 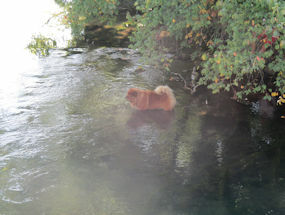 It was a really hot summer day and the river looked just too good for this furry friend to resist! 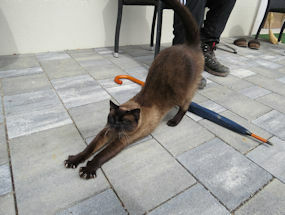 And Jason the Siamese cat loves nothing better than a good stretch.. he really is a big moglet, is he longer than the umbrella?? 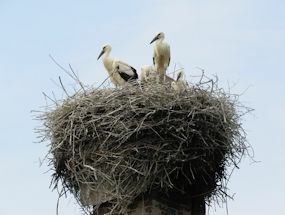 These guys are the Stork family who have a massive nest on top of a chimney in a village near to Landol! The locals get very excited when mum & dad return from South Africa every year to start a new family, as it means spring has started! How many chicks can you count in the nest? 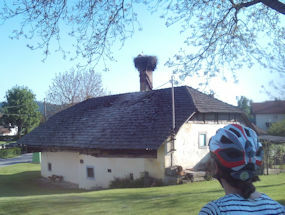 The answer in Slovenian is "tri", look it up! 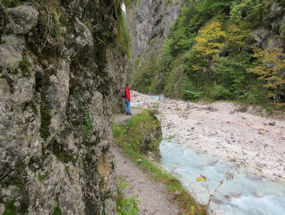 Spot the difference: We found an amazing hike along a grey/blue crystal clear river in the Slovenian Julian Alps that leads to 2 waterfalls.. now you see Hanna.. now you don't! We also found a place we describe as "Rock Alley" just around the corner from where the photos above were taken! 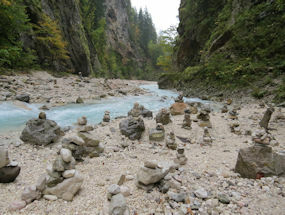 Wow, it must take ages to find your stones and make a little rock statue. 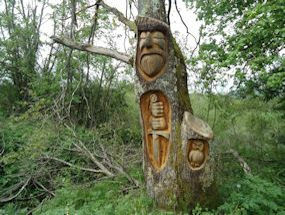 This spot reminds us of places in Peru where these "stone people" can be found alongside beautiful places in nature. / Above right is on the way to the bigger waterfalls in the mountains. Can you see the 2 diving boards on the rocks? 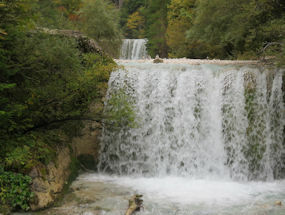 Would you jump off and have a swim?! 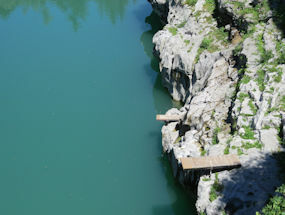 The river is the beautiful Soca at a place called Kanal, but the really scary thing is that the photo is taken from a bridge high above the river and there is another diving board up there!!! 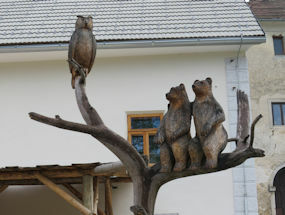 / Check out the wooden bears and the owl sitting on a tree at the nearby Predjama castle! 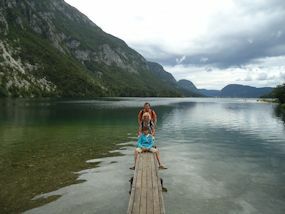 Just check out some of the crazy frog things you can do in Slovenia and create these cool photos, firstly at the huge crystal clear lake Bohinj on the plank and secondly at the entrance to the fab castle overlooking the town of Ptuj, (don't even try to say that word)! We just love taking pictures of moglets on our travels.. check out this one, he looks like an owl and can you see the white cat peeking out of the window?! 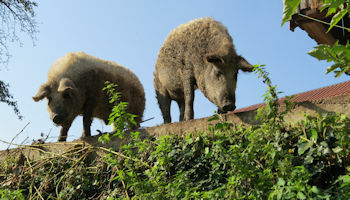 And look where we met these 2 furry pigs! 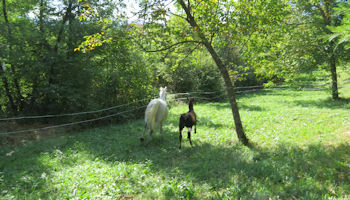 We were just driving into a village in the mountains and they both came out to say hello! Here is a Slovenian sheepdog puppy, these guys are one of the few native Slovenian dog breeds and when they grow up they live with their flock of sheep and even look a bit like a sheep, but they are very brave and ferocious if their flock are attacked, we even heard a story where one Slovenian sheepdog scared off a pack of wolves! 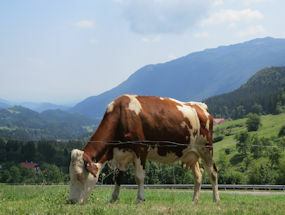 / Check out where the Milka cow goes on holiday.. Green Slovenia of course! 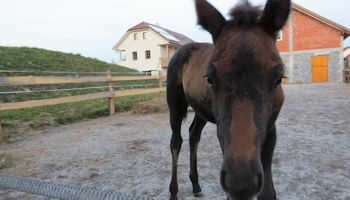 Our Lipizzaners are having a great time running around in the fields at Lipizzaner Lodge and the foal Gandalf is very curious and cheeky.. Did you know that Lipizzaner foals start off as dark brown and usually turn grey/white when they grow up?! 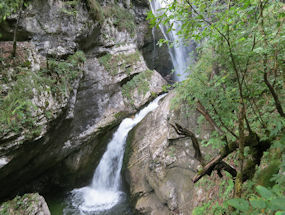 Here is a "Now you see it, Now you don't" and this is the fabulous Pericnik waterfall on the way to Slovenia's biggest mountain, Triglav, which means 3 Heads. The waterfall itself is very tall, but it only takes about 20 mins to walk almost right up to the top where you could almost touch it! But if you get too close your camera lens will get wet! 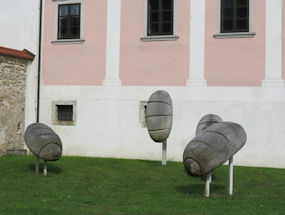 If you want to see crazy alien wooden loaves of bread wandering around and space invaders hiding in fields then just go to the village of Chestnut to find Slovenia's largest art gallery in a massive converted monastery with hundreds of wooden sculptures in the surrounding countryside! 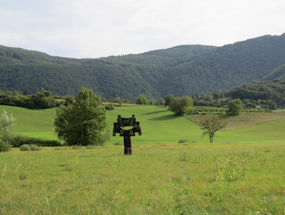 OK so here is a "Spot the Difference " quiz, on the left the sniper hole is closed and on the right the hole is open and you can find this living museum very close to Bovec in the Soca valley which was the tragic scene of the largest mountain battle of all time in WW1. 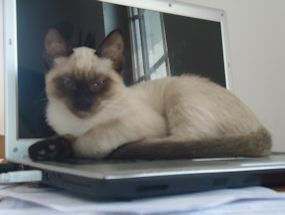 Here's a few vintage photos for Jason and Tilda fans.. both were very cute kittens indeed! Jason likes nothing better than having a cuddle with his fans, but it's not all work, work, work as the 2 rascals also like to take it easy on the Yew tree terrace. 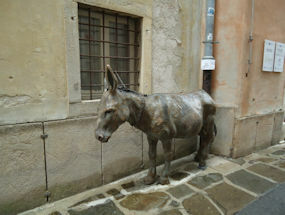 If you find the donkey in Isola then congratulations, you will be standing outside the fab "trains and sea museum" in pretty Izola on the coast. 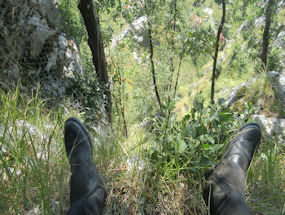 / You can find the sleeping Knight on one of the hiking routes from Lipizzaner Lodge to the amazing Postojna caves.. not too far, by the way, from another secret prehistoric Neanderthal cave. Surf's up! 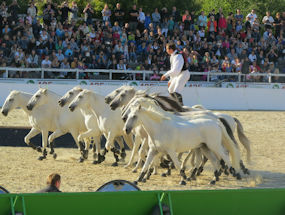 Yes you can believe your eyes, this French guy is really horse surfing during a show at the local Lipica stud! 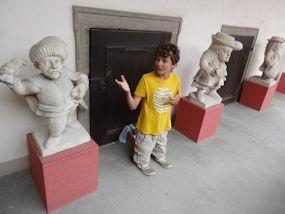 Odd One Out: Now for a couple of chances to see who is the odd one out and of course in the first picture taken at the wonderful castle museum of Ptuj, you can clearly see the stone staue with the yellow T shirt doesn't have a hat! 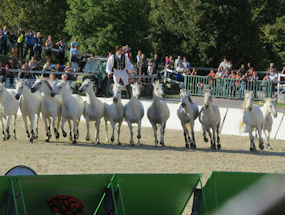 / And the second photo is also really easy, as Rihard Basa on the left, is the only famous Slovenian chef out of the three!! "He's behind You!" 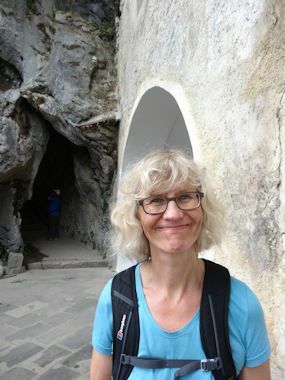 Check out the legendary wizard of one of our favourite mountains in Slovenia, Velika Planina,"Heaven on Earth" appearing behind a little girl, but look carefully.. he also appears in both the postcards.. what magic is this! / Why not get locked in the stocks at the incredibubble Cucumber castle.. has anyone got any rotten fruit!! 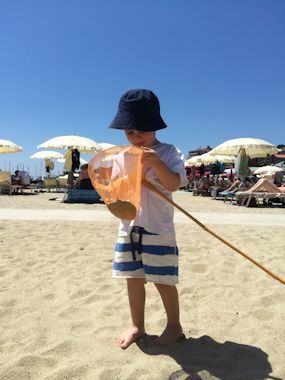 If you thought that the beaches on Slovenia's Adriatic Riviera were all stone, then you should take a trip to Portoroz and don't forget to pack a butterfly net! 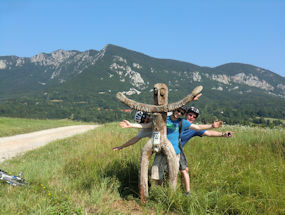 / Not far from the Lodge you can hang out with the "Wooden Man".. he's a really good marker for directions on the many walks and hikes from the Lodge into the local Slovenian paradise. So either this is a photo of a pair of shoes in the local forest, or it's a relax photo, we love it when our guests have a relaxing time! 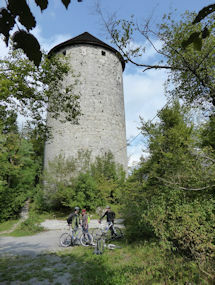 / Check out Rapunzel's tower in the forest, just a bike ride away from the lodge! Sometimes Rapunzel is at home and you can see her long blonde hair hanging out the top window, waiting for her prince to rescue her.. other times she's out shopping with Goldilocks!! 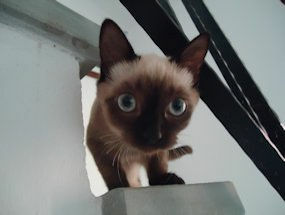 Can you guess where this young Belgian guest squeezed into? 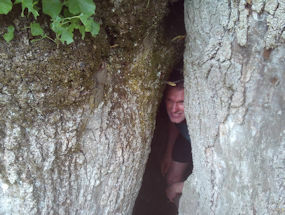 It's a huge huge hollow tree at a nearby deserted castle! 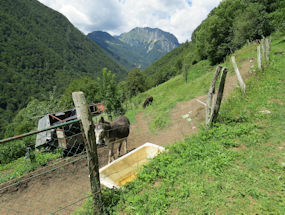 / And check out the view these donkeys have of the Slovenian Alps.. What do you call a donkey who lives on the side of a mountain? A wonkey donkey!!! !